A spectacular adventure packed with world-class resorts and a mosaic of landscapes awaits you as you travel from the towering mountains of the Rockies to the rugged coastlines of the Pacific. 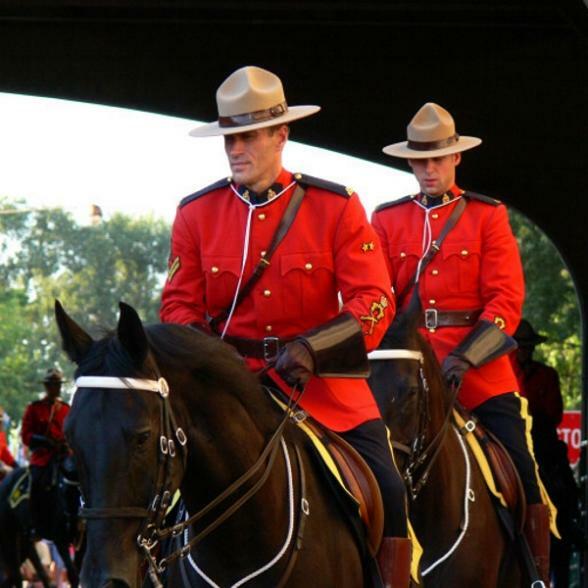 From the urban cowboys of Calgary, the route heads for the Rocky Mountains and the wilderness of Banff National Park. Here, you will experience the majesty of Lake Louise. The discovery tour of Canada's national parks continues along the scenic Icefields Parkway with a visit to Jasper. The scenic splendours of Wells Gray Provincial Park and the Thompson River are next to take centre stage before enjoying two days in the relaxing setting of Tyax Mountain Lake Resort. 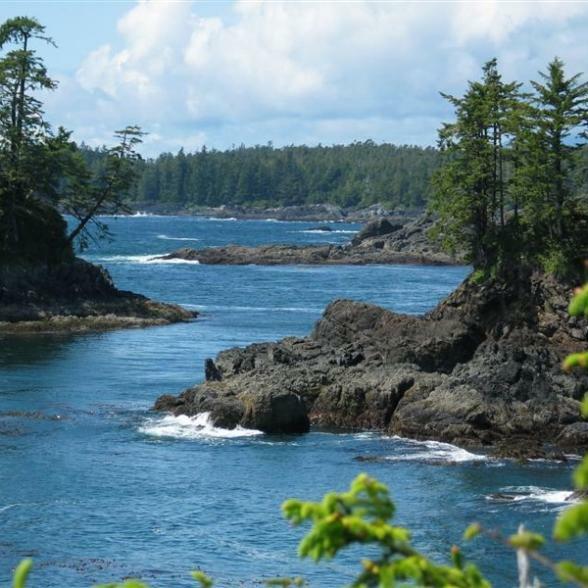 After indulging in the outdoor paradise of Whistler your trail leads to the Pacific Rim National Park, on the Pacific coast of Vancouver Island. Your adventure is completed with a visit to historic Victoria and cosmopolitan Vancouver. 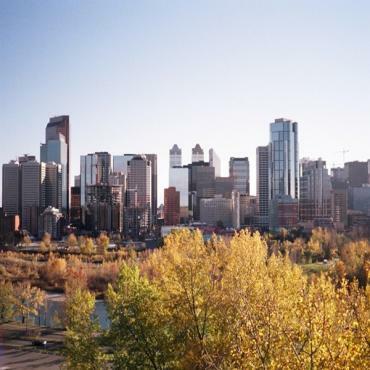 Leaving Calgary behind, you will set your sights today on the magnificent Rocky Mountains. 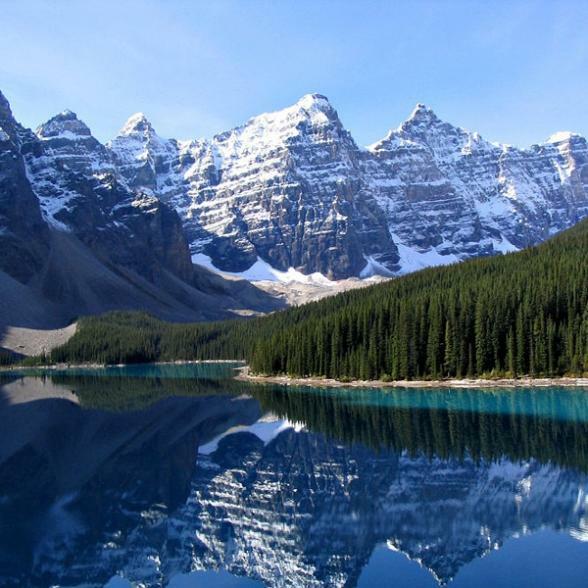 Experience the majesty of the mountains as you first travel through the foothills and then enter Banff National Park where the craggy peaks look larger the closer you get. 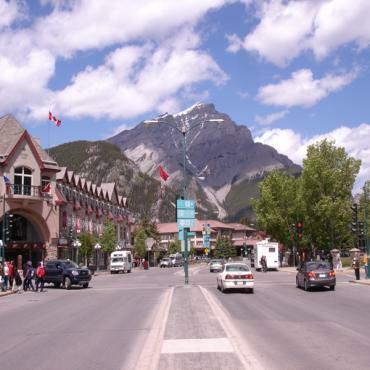 After you have arrived in the bustling town of Banff, the remainder of the day is free to explore its charms. Overnight in Banff. Banff National Park is a stunning wilderness and your outdoor playground for the day. 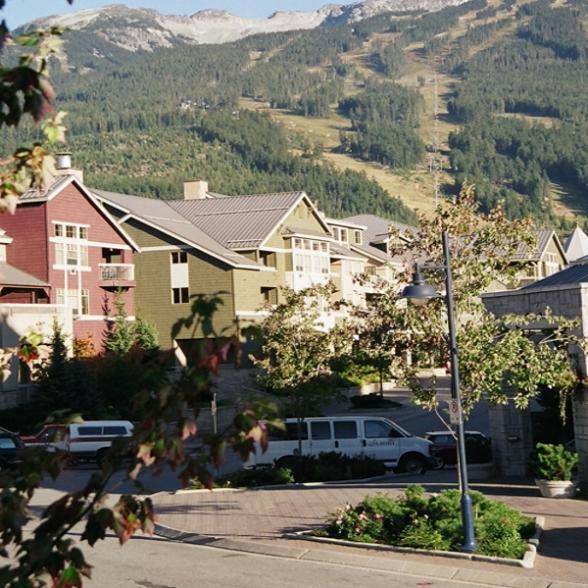 Enjoy a gondola ride to the top of Sulphur Mountain for some panoramic views, visit the Cave and Basin, hike along one of the groomed trails or stroll through the town site of Banff to shop in the many boutiques and shops. Overnight in Banff. Escape into the Canadian Rockies for a 2-hour trail ride. 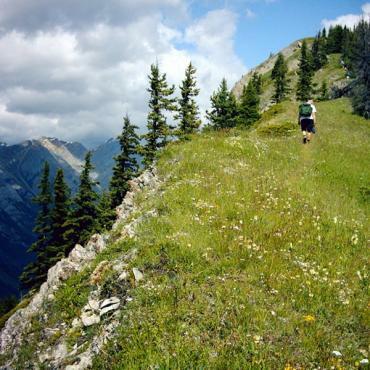 Follow the Bow River and traverse the side of Sulphur Mountain. 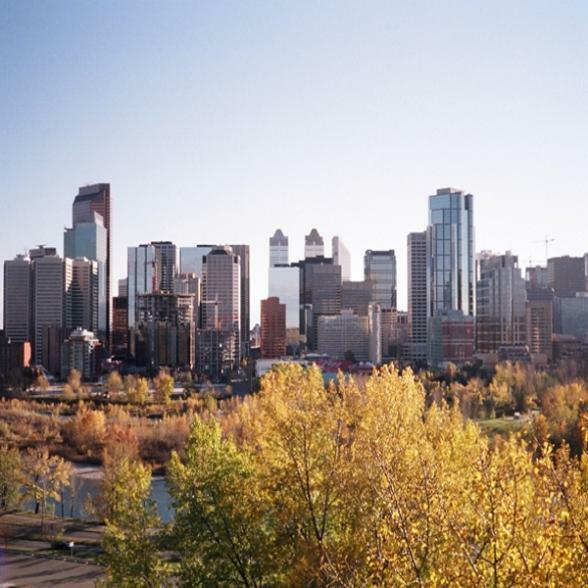 This is an excellent opportunity to capture panoramic views of the valley from the Bow River and Sulphur Mountain. This excursion is suitable for novice to experienced rider. 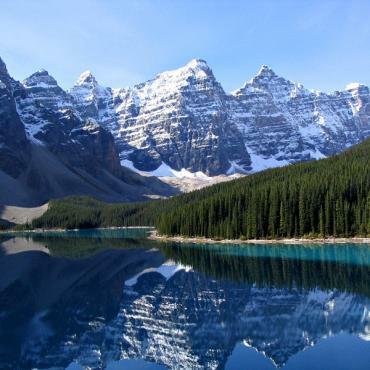 Today you will be driving through the Bow Valley to get to beautiful Lake Louise. 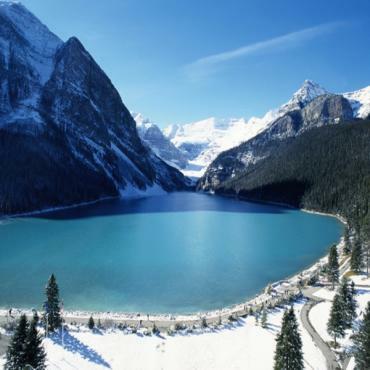 Lake Louise is the acclaimed Jewel of the Rockies and said to be Canada's most photographed lake. With the Victoria Glacier in the background, this emerald-coloured lake is sure to leave an indelible impression. Admire the beauty of the lake from inside the Fairmont Chateau Lake Louise, which stands atop a giant glacial moraine. From across the valley from Lake Louise Village, you can take a chairlift up Whitehorn Mountain. Overnight in Lake Louise. Drive to Jasper via the spectacular Icefields Parkway, said to be one of the most scenic routes in the entire world. 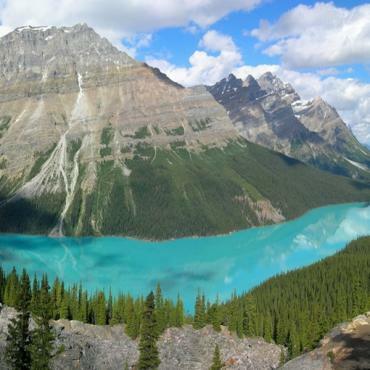 We suggest a stop at Peyto Lake and a visit to Maligne Canyon in Jasper National Park. 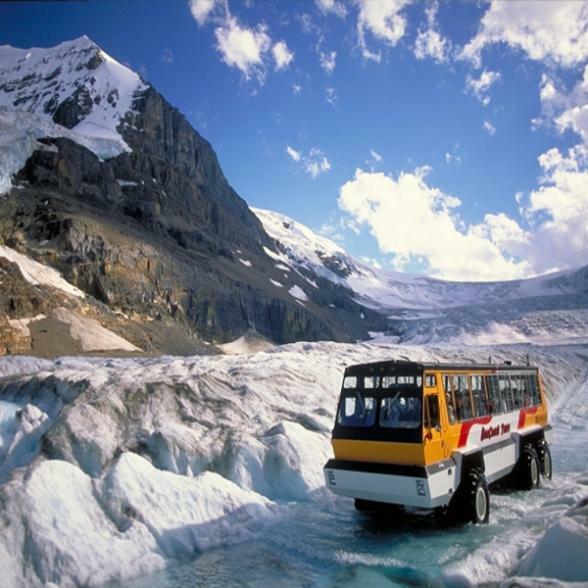 At the Columbia Icefield, take an Ice Explorer ride onto the massive glacier and experience the thrill of walking on centuries-old glacial ice. After this exciting experience return to the road for the final stretch to the resort town of Jasper. Overnight in Jasper. Today is at your leisure to explore the uniquely beautiful landscape of Jasper National Park where serene lakes and gentle meadows stand in stark contrast to its jagged peaks and spectacular glaciers. We suggest a Maligne Lake boat cruise, a visit to Miette Hot Springs, or a ride on the Jasper Tramway. Overnight in Jasper. Why not embark on a fun, 16-kilometre raft/float trip while gaining a unique perspective of Jasper National Park from the Athabasca River. A National Park licensed guide will provide commentary on the human and natural history of Jasper while navigating you along the same route used by the fur traders almost 2 centuries ago. Enjoy incomparable views of Jasper National Park on this designated Canadian Heritage River, as you pass through calm stretches interspersed by small sets of rapids. Lifejackets and specially designed rafts offer a safe and comfortable trip. Fun for the whole family. Drive the scenic Yellowhead Highway to Wells Gray Park. Before leaving the Rocky Mountains you will encounter one of its most spectacular sights, the mist-shrouded peak of Mount Robson. The highest peak in the Rockies can be seen for miles as you wind your way south through a vast unspoiled landscape. A visit to the volcano-shaped wilderness of Wells Gray Provincial Park is worth the detour. Explore the park's mineral springs, serene lakes, dormant volcanoes and rushing falls. Not to be missed are the towering Helmcken Falls near the entrance to the park. Overnight in Clearwater. This morning perhaps visit the Yellowhead Museum for a taste of frontier life or Spahats Creek Park before travelling through the Lakes Country region. As you follow the Cariboo Highway south, you will visit towns and villages that echo the past, as this route was travelled by gold seekers and traders during the famous Cariboo Gold Rush of the late 1800s. Be prepared for the largest log lodge in the West: Tyax Mountain Resort. Here you will be able to indulge in all your adventurous dreams. 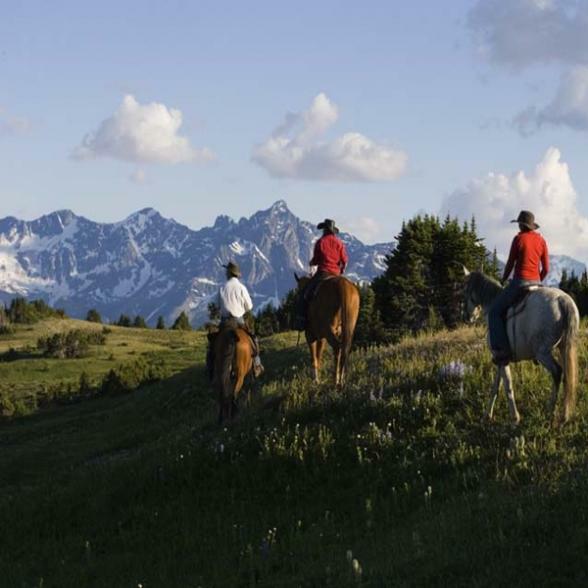 Everything from bird and wildlife watching to horseback riding, mountain biking and gold panning. Overnight at Tyax Mountain Lake Resort. Enjoy your day in Gold Bridge where you will find a unique combination of wilderness, outdoor adventure and first-class facilities. You can discover the surrounding area on a hiking excursion on one of the many eco trails. Overnight in Gold Bridge. Tyax Mountain Lake Resort offers an amazing recreation package, and you can choose from a wide selection of activities to create an exciting and fun-filled day. Go horseback riding in the backcountry, canoe down the scenic waterway, or enjoy a guided hike with a chance to see bears, moose and wolves. Why not try your hand at rodeo or archery, or relive the pioneering days and pan for gold in a riverbed. Once in Whistler, play a round of golf in the shadow of towering mountains, hike along endless trails and high alpine meadows, ride on horseback past spectacular glaciers or whitewater raft down one of the turbulent rivers. You may wish just to relax in the enchanting setting of the pedestrian village and enjoy the boutiques, restaurants and cafés. Overnight in Whistler. Travel the Sea-to-Sky Highway through a landscape carved out by glaciers and edged by craggy fjords. After a brief stop at Shannon Falls continue to Horseshoe Bay where you will board a ferry to sail across the Strait of Georgia to Vancouver Island. 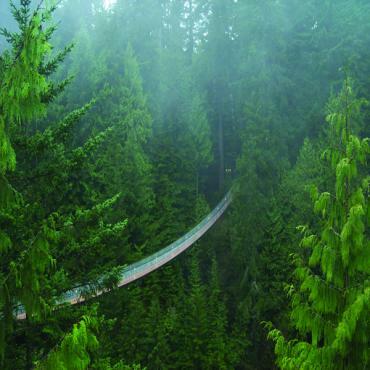 Your drive to the Pacific Coast will take you through ancient rainforests and provincial parks. 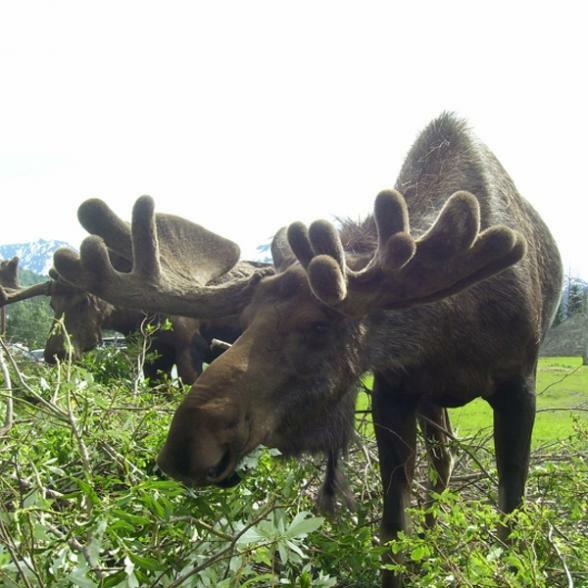 You are venturing into true wildlife territory here, and you might even catch a glimpse of bears, deer or wolves. The Pacific Rim National Park is a marvel of ecological and geographical diversity as you will see as you pass through dense rainforests, steep ravines and windswept beaches. 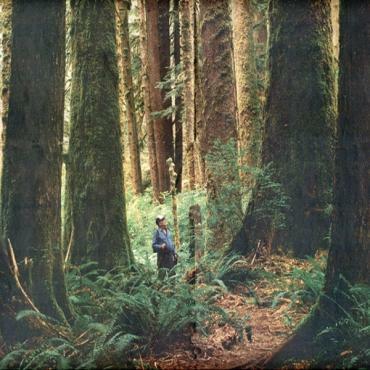 Overnight in Pacific Rim National Park. Your day is at leisure to explore the rugged coastline along the network of hiking trails or walk the shoreline of Long Beach in search of shells and driftwood. Overnight in Pacific Rim National Park. This morning's drive will take you back to the east coast of Vancouver Island. En route you might want to visit Horne Lake Caves or Cathedral Cove. The coastal road winds through quaint seaside towns and the murals of Chemainus and the quaint Quw'utsun' Cultural and Conference Centre in Duncan are well worth the visit. The day winds down in Victoria, the capital of British Columbia. This beautiful city has a fascinating maritime heritage and has carefully preserved its colonial charm. 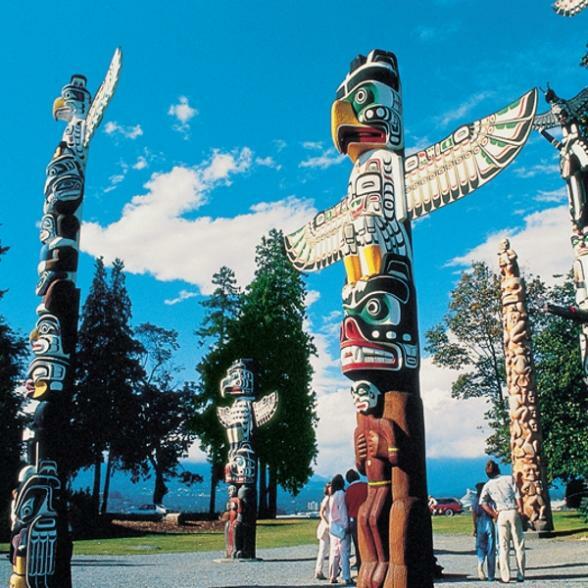 Visit the harbour area, the totem poles of Thunderbird Park or the Royal British Columbia Museum. For an unforgettably elegant end to your day, visit the Empress Hotel for a traditional High Tea. Overnight in Victoria. Before you leave Vancouver Island we recommend you visit Butchart Gardens, a magnificent display of flowers and shrubs set in an old stone quarry. Enjoy a mini-cruise on BC Ferries guiding you around the many Gulf Islands through the Strait of Georgia to mainland British Columbia. 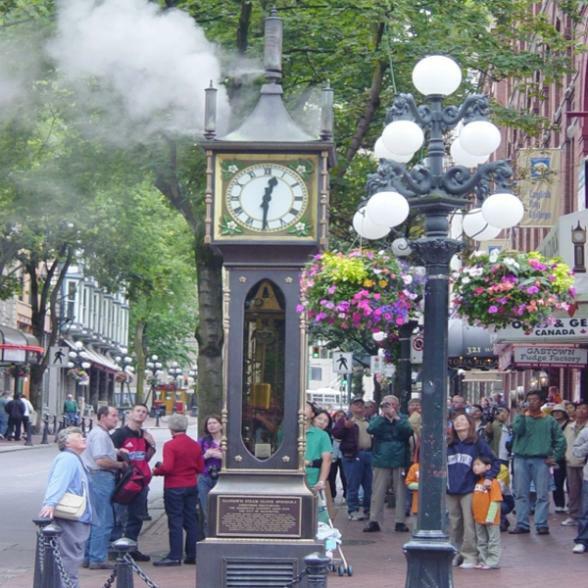 The rest of the day is at your leisure to enjoy the stores, parks, restaurants, theatres and other attractions of downtown Vancouver. Overnight in Vancouver. You have the entire day to tour Vancouver and the surrounding area. 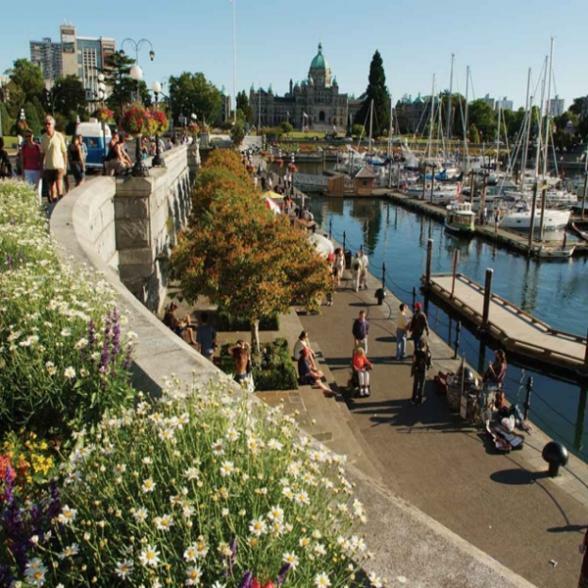 Situated in a magnificent setting among the sea, the beaches, the harbour and the steep Coast Mountains, Vancouver is considered to be the Jewel of North America's Pacific Coast. Explore its cosmopolitan atmosphere with its diverse cultural, recreational, shopping and dining facilities that appeal to all tastes. Don't miss a visit to the amazing Capilano Suspension Bridge. Overnight in Vancouver. Today is your last day before heading back to the UK, however your adventure doesn't have to end here. Perhaps you may want to extend your stay and travel the border to America and the Cascade Mountains or maybe stop off at Canada's capital, Ottawa, on your way back home?